There are many sites that helps you chat online, make chat rooms that help you chat with people other than using instant messengers etc. but the best one i liked and thought its worth sharing is Tinychat. TinyChat is not just a simple chat site, but is something more than that. You can do the best video conferencing with it. Tinychat delivers dead simple video conferences without the extraneous ad-ons and inconvenience, making video conferencing an accessible, uncomplicated experience. It works on Windows, Mac and Linux; with Firefox, IE, Safari, and Chrome; and there is a version available for iPhones. These all above features can be done only when you have started the chat session. The tinychat website has free and pro membership, with latter costing $14.95. 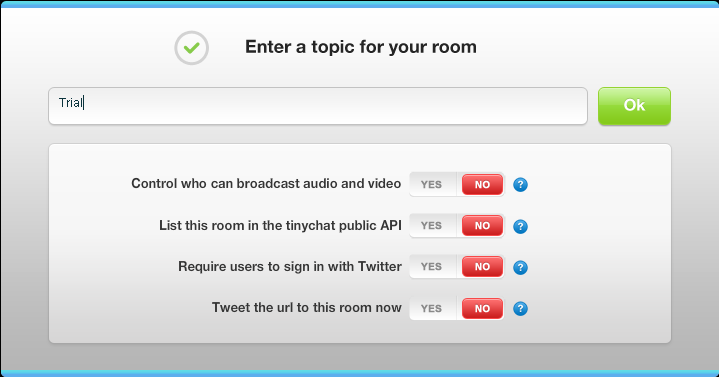 For the pro users, there are additional features like controlling 5 rooms at a time, HQ video broadcasting, setting up of passwords for broadcasts, and also you can record and download the chat session. Though free isn’t bad for a casual chat for few people who need nothing much to setup. Check out Tinychat at Tinychat.com! This looks really cool as many tools like this are being introduced in the market it been a confusion for which one to choose but now as you recommended this one i will check it out once.